Cover blown? This envelope, or "cover," may have revealed the names of China's second group of astronauts. Could a collectible have just outed the names of China's second group of astronauts? 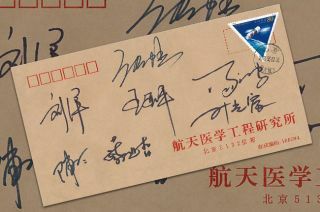 That is the conclusion reached by two international space observers, who found an offer for a postmarked envelope — or "philatelic cover," as collectors refer to it — signed by seven Chinese pilots. The group included two women, one of whom may soon be China's first female astronaut, or "taikonaut," to reach space. "The names of the military pilots selected in 2010 to form China's second group of taikonauts — which have been a closely guarded secret for the last 18 months — appear to have been released [as the result of] a possible philatelic blunder," said Tony Quine, an Isle of Man-based space memorabilia collector and contributing writer for the British Interplanetary Society's "Spaceflight" magazine. Quine worked with Russian space industry expert Igor Lissov to confirm the envelope's autographs since finding it listed for sale on a German space dealer's website two days ago. The two elicited the assistance of Chinese space enthusiasts to help verify the translation of the seven signatures. The stamped envelope was postmarked in China on May 10, 2010, the same day that the country's space program reportedly appointed the candidates to its astronaut corps. While China earlier confirmed that it had indeed selected seven pilots — including two women — for its human spaceflight program, the nation has yet to release the names of its latest trainees. The seven names listed on the cover include five men — Zhang Hu, Chen Dong, Cai Xuzhe, Tang Hongbo and Yi Guangfu — and two women, Liu Yang and Wang Yaping. "Chinese [online] forum sources have helped to verify the names as far as [was] possible from interpretation of the signatures," Quine said. At least one of the women was already known to Quine. In November 2010, his sources close to the Chinese space program confirmed that Wang was one of two female Air Force pilots vying to become the country's first woman in space. The other, Liu, remained unnamed until Quine and Lissov saw the cover. "Liu Yang is also known to be a member of the same generation of Peoples Liberation Army Air Force female transport pilots as Wang, and has previously featured in the Chinese media for her aviation exploits," said Quine. "As such, her inclusion in the group is logical and there need be little doubt about the accuracy of her name appearing on the offending cover." The seven pilots selected in 2010 joined the ranks of the earlier class, recruited between 1996 and 1998. Only the latest group's names have been kept confidential. The 14 taikonauts selected earlier are widely known. At least one, if not both, of its upcoming two missions are expected to be crewed. The Shenzhou 9 and Shenzhou 10 missions will fly to China's Tiangong-1 space module to practice techniques to establish a permanent outpost in Earth orbit and to conduct science experiments. "Recent reports from China during the Tiangong-1 and Shenzhou 8 missions had mentioned that two women, together with seven men from the original 1998 taikonaut selection, formed the nine person training group for the anticipated Shenzhou 9 and 10 flights, [which are] planned to visit Tiangong-1 in 2012," Quine said. "We can now be certain that the two women are Wang and Liu, and that, in all probability, one of them will become the first Chinese woman in space, within the next year." Whoever is selected, Wang or Liu, will become just the 56th woman to launch into space out of the more than 500 space travelers worldwide. Russian cosmonaut Valentina Tereshkova became the world's first woman in space in 1963. Sally Ride, the United States' first female astronaut, didn't reach orbit until 20 years later. As for the five male members of China's 2010 class, they may have to wait as they watch their female counterparts fly. "These five men are not involved in the Shenzhou 9 and 10 missions, suggesting that they will have to wait until at least the Tiangong-2 series of missions scheduled [for] no earlier than 2013," Quine said.